Since duck doesn’t understand what chicken said. For human, we also had the same problem to deal with foreigner. Twitter is a very popular free social messaging utility for staying connected in real-time connecting people with different language around the world currently. Here is a new service for you known as Twitrans if you use Twitter. 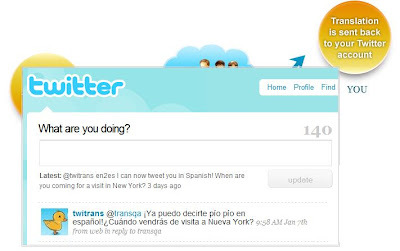 It translates you tweets to your desired language and get the translation back in your Twitter home page. -To get more help, please send @twitrans help or @twitrans codes. -Available language codes: Arabic-ar, Chinese-zh, Dutch-nl, English-en, French-fr, German-de, Greek-el, Hebrew-he, Hindi-hi, Italian-it, Japanese-jp, Portuguese-pt, Russian-ru, Spanish-es.